“…with all of Carol’s strengths and sense of adventure she would be the first to admit that her two great fears are heights and crocodiles and we were about to mix the two. 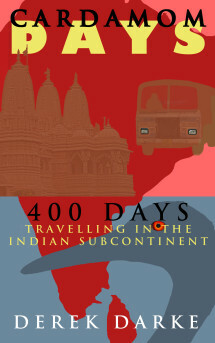 The assistant guide, who was the one carrying the rhino lip smacking stick, was sent across the bridge first to test its safety and Carol insisted on going next…” Having given up their jobs and comfortable lifestyle Carol and Derek hoisted their rucksacks onto their backs and headed off on a journey around the Indian Sub-Continent. The plan was partly to take in as much of the ancient culture and spot as much wildlife as possible, but mainly it was to rub shoulders with local people in the many towns and villages they were to visit, which meant travelling mostly on local buses and staying in homestays and guest houses. The trip began with a short stay in Sri Lanka, somewhere they would visit again at the end of the journey, and then continued into India where they took six months to travel towards the Himalaya before entering Nepal. The journey took them to bustling temple towns, quieter rural areas where the world seemed to have stood still and into hot deserts and cooler mountains. They encountered lions and tigers, rhino and snakes, enjoyed friendly hospitality and fed upon freshly cooked food from street traders and in scruffy dhabas. This was not a journey for the faint hearted and it was crazy, fun, sometimes hilarious and at times downright infuriating. But it was never dull and often extraordinary.